Based on the play by Wajdi Mouawad, Canadian director Denis Villeneuve's latest film has the skeleton of a Greek tragedy and the flesh of political allegory, reminding us that history repeats itself and that death isn't always the end. Having the short films Next Floor and 120 Seconds to Get Elected under his belt — both political criticisms in their own right — this sort of liberal plea is appropriate, even though his prior features have leaned more towards individual perception than global ideologue. Opening with Radiohead's "You and What Army," a taunt decrying of Tony Blair's New Labour government, Incendies is divided into several sections — each defined by bold red titles that cover the screen — telling the modern day story of twins Jeanne and Simon Marwan (Melissa Desormeaux-Poulin and Maxim Gaudette), and their mother Nawal (Lubna Azabal) in '70s Lebanon. Handed two envelopes upon Nawal's death, the twins are instructed to travel back to the Middle East to explore her past and possibly find their long lost brother, a child we see given up for adoption against Nawal's will when the film jumps back in time. Their investigation proves quite cumbersome, requiring travel throughout Lebanon to visit their mother's old school and a village where she once resided, speaking with older locals and ex-militia leaders about orphanage records and hearsay whereabouts. These moments in the present never work quite as well as those in the past, as Nawal's political motivations as a Christian fighting for the rights of slaughtered Muslims prove more compelling than the modern realization of such by her children. 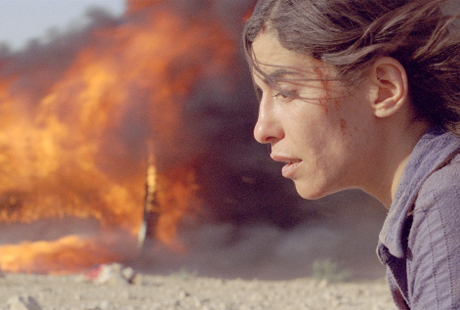 Being somewhat uneven and surprisingly less polished than Villeneuve's last work (Polytechnique), this sharp observation of exploring the past to contextualize the present works mainly because of the profundity of key moments and a bravura performance from Lubna Azabal. A scene midway through the film shows Nawal riding a Muslim bus towards the south end of the country, only to come under fire by rightwing Christian militants. This is easily the most harrowing, disturbing and compositionally beautiful sequence I've seen in recent memory, which makes up for much of the clunky exposition and plot machinations surrounding it.